Haven't seen any rumblings around here about the best 3D shoot of the year, thats only 12 days away!! I'm looking forward to getting out of town and spending some time with you good people! I’m planning to be there, looking forward to it ! Can't wait, one of my favorite places to go in Texas. Good scenery, good food, and good friends. Can't get much better. I'm workin on it but it's my anniversary date. Wish I could make it, but my daughter is getting her Aggie ring that weekend! I'll be there! Always a great shoot! That's a long roll from Fort Worth. 150 mi. less than mine. And you're 150 yrs younger than me. Its been ten years since I have been, thinking about going. When did they move it from the Bugscuffle Ranch, and hows the area for tent camping at Growing Rocks Ranch. This will be the 3rd time at Growing Rocks. There are plenty of good places to tent camp. When they said it was ending at Bugscuffle, I was sad because I did not think it would be as good. After a couple years, I actually like the new range better. The only thing the Bugscuffle had on Growing Rocks was a better place for vendors to set up. It’s all out in the open now, with no shade. I would love to make it, but it's 1600 miles one way for me. God is younger than you. Was gonna ask for address but found it! Got got austin that friday anyway so might as well make the shoot!! Last edited by smokin feathers; 04-05-2019 at 02:20 PM. Saturday @ 4:30 the IBO director, Levy Bryant, will put on a really fun event for all of us at the Hill Country Shootout. It is a shooting game, with a field of five or so targets. All skill levels can play, and several winners along the way to find the Last Man Standing. Win prizes, and cash money on the way to the final champion, who wins a big $$$ pot, and the grizzly bear trophy. Schedule to shoot it, Saturday @ 4:30. Doesn't take long, and lots of fun and laughs. Sadly this will be the third year in a row that I'll miss, maybe next year. Skunklady that trophy is AWESOME. I am going to make it this year. Looking forward to seeing old friends and meeting new ones. Anyone know if arrival Friday evening for tent camping is allowable? It has always been OK in the past, and while i haven't checked this year, I am going to be there Friday night to set up. It’s been ok in the past. I’m planning on setting up Friday as well and if I get there early enough, volunteer to help set up. Weather looks like a chance of showers on Sat, bring something to cover your feathers with. Feathers!! What about my pretty white hair??? Was a great time. Saw a lot of old friends and met some new. Good time. Sure wish I could have made it this year. Couldn't get out of my night shifts. Hope everyone had a great time. Once again, it was a great course at a great place!!!! Good seeing everyone!!! Another good one thanks to all that helped to put it on see yaw next year. Great course. Loved the up and down shots. Nice to practice those. What was your favorite shot? Mine was #25, the bedded gray ram on the rocks. With the wind coming through on Saturday, it was, for me, the hardest shot on the course, especially from the orange stake. Loved all of it. I missed it, I am busy beginning a new career. I will try next year. 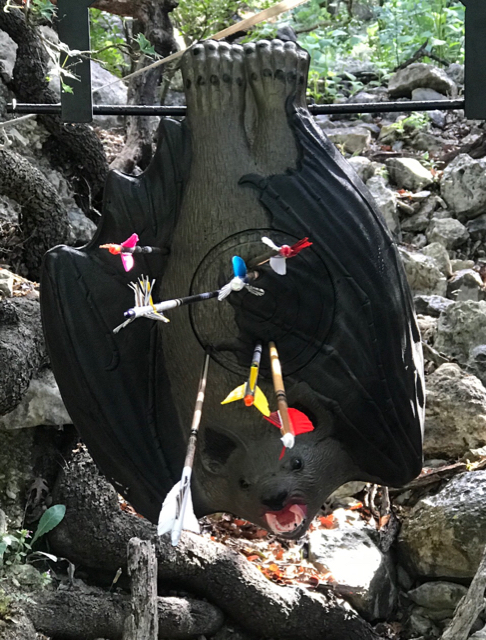 Don’t know if it was my favorite, but the bat target is one I have never seen before, and is pretty dang cool looking!!! And that ram can KMA!!!!! In 5rds, I never did score higher than a 5 on it!!!! Last edited by Bisch; 04-15-2019 at 04:51 PM. Another great year! Thanks to everyone that makes this awesome shoot happen!! If you shoot a trad bow you need to make this shoot!!!! Great people, great part of the state for a tournament, and challenging course. My favorite targets were the ones Rusty got a 5 on when we shared a round! I was kinda liking his zeros!!!! Great shoot again, thanks to everyone who worked hard to make it another success! Which ram, target 48? Or the Corsican on the first half? Had a blast again this year. I liked the alligator due to the small margin for vertical error, and if you miss your arrow is toast. Great course, great people, bad shooting on my part!! I still had fun though. Good meeting and shooting with you Bob. The # 25 ram can KMA too! !